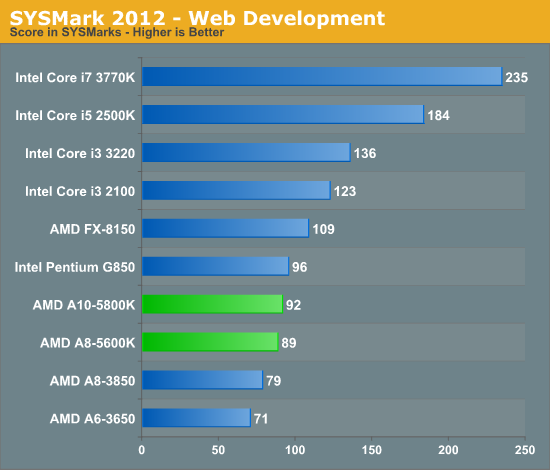 Although not the best indication of overall system performance, the SYSMark 2012 suite does give us a good idea of lighter workloads than we're used to testing. 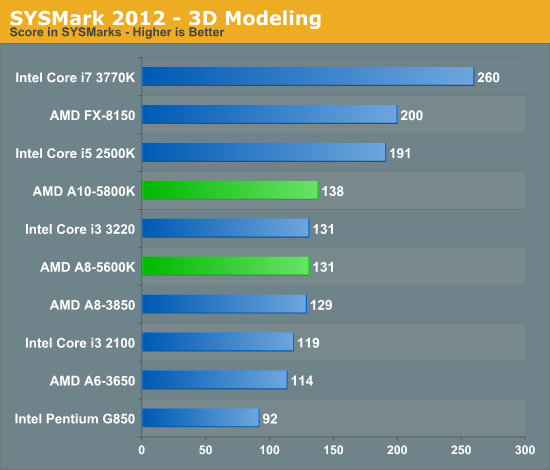 AMD does surprisingly well here in SYSMark 2012. The Core i3 3220 manages a 12% advantage over the 5800K, but that's not as much as we'd normally expect given the significant single threaded performance deficit we pointed out earlier. Once again, whether or not Trinity makes sense for you depends on how much you value processor graphics performance. It's good to finally see pricing on Trinity. Looks like AMD is still competitive at lower price points for Video transcoding performance, which is good news for me and others who's highest CPU workloads are mostly video editing. But even for gaming the A10-5800/K doesn't look too bad for $122 chips. It's also slower than an old Core 2 Quad Q6600 overclocked to 3.6ghz+ which was released in 2007 both in single threaded and multi-threaded tasks. Really cool how the performance charts are NOT static. What kind of progress are you talking about? Power efficiency? Raw general computing performance? Progress comes in many forms. AMD's progress is about 2 years behind. While this is somewhat intel's fault by illegal competitive practices which in turn kept AMD from profiting as much as they could have during the Athlon64~X2 era. AMD has done a lot of things wrong and would take at least 2 years to sort out... if ever. FM2 is no better than FM1 and not cross compatible. Neither is compatible with Socket AM3 and nothing AMD has on the market even supports PCIe 3.0. Compared to buying an intel i3-something system, in which you can upgrade to an i7-something easily. 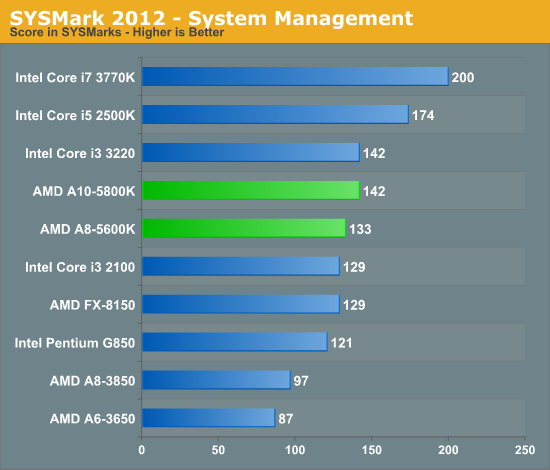 AMD has a mess on their hands and I suspect part of their performance problems could also be rooted in their chipsets. (Across the board, the performance hits a wall). Yeah, for a notebook - the powerful GPU part comes into play. 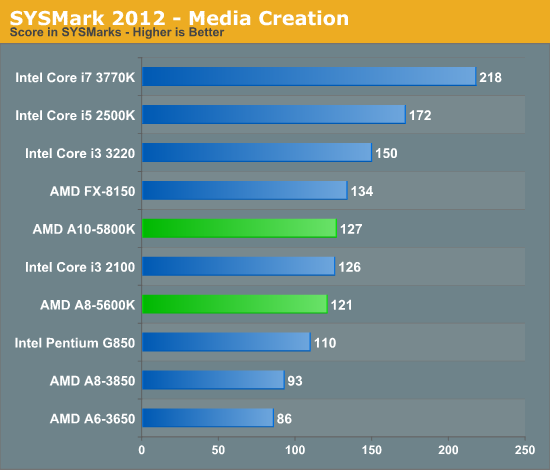 And both intel i3 and Trinity is more than powerful enough for MOST people. 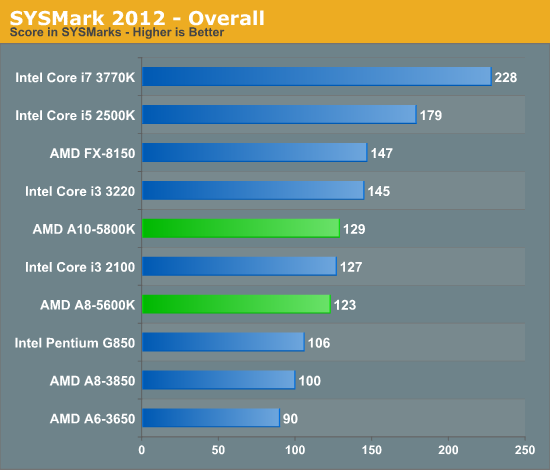 hell, I'm still running on a Q6600 at 2.4Ghz and it does quite well (going i5-3570 this weekend)... 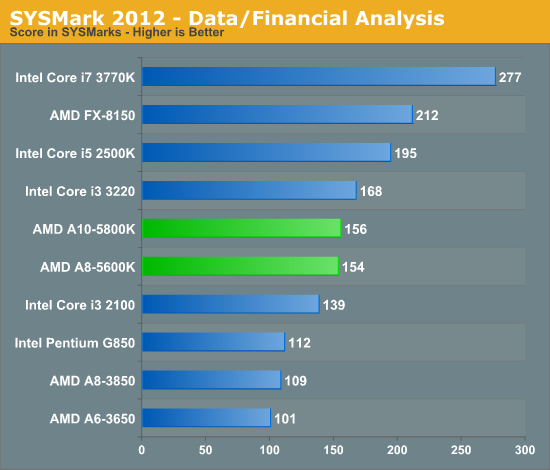 But for those who want their money's worth when performance counts, AMD is not in the game. The performance from AMD has to be consistent, and its not. The heat is not good along with the cheap fans they include that are noisy and should be replaced with a good $20~50 cooler. 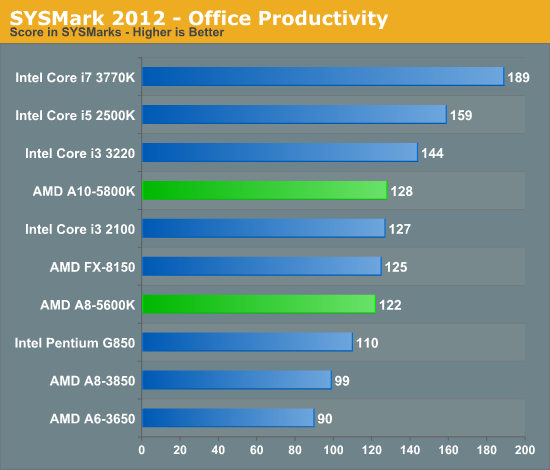 Meanwhile intel CPUs are running cooler and their fans are very quiet. About PCIe 3.0, nobody needs that. 2.0 * 8 is enough to drive every card on the market with maybe 2% performance loss, which is within the error margin of every benchmark. To keep prices low, of course they're not going to add extra features that nobody needs. I think it's a smart move.